This application protocol uses the Anti-GLAST antibody to generate highly purified and viable astrocytes from neonatal mouse brain tissue. A single cell-suspension is generated from brain tissue of mice younger than P8 through combined enzymatic and mechanical dissociation. Astrocytes are isolated from the single-cell suspension using the Anti-GLAST (ACSA-1) MicroBead Kit. This procedure was tested particularly on P5–7 dissociated mouse brain tissue, derived from CD-1® mice and containing approximately 12–18% GLAST+ cells. MACS Columns and MACS Separators: GLAST+ cells can be enriched by using MS or LS Columns. Positive selection can also be performed by using the autoMACS® Pro Separator or the MultiMACS™ Cell24 Separator. (# 130‑095‑821) or Anti-GLAST (ACSA-1)-APC (# 130‑095‑814). Learn more about our antibodies and dyes. Isolate the GLAST-positive astrocytes from the single-cell suspension using the Anti-GLAST (ACSA-1) MicroBead Kit. Follow the protocol of the kit data sheet. Effective isolation of GLAST+ cells from mouse brain tissue. Mouse brain tissue (P7) was dissociated using the Neural Tissue Dissociation Kit (T), the gentleMACS™ Dissociator, and FcR Blocking Reagent, mouse. Astrocytes were isolated from single-cell suspension using the Anti-GLAST (ACSA-1) MicroBead Kit, a MiniMACS™ Separator and an MS Column. Cells were fluorescently stained with Anti-GLAST (ACSA-1)-APC and analyzed by flow cytometry on the MACSQuant® Analyzer. Cell debris and dead cells were excluded from the analysis based on scatter signals and propidium iodide fluorescence. Use 100 μL of the GLAST+ fraction for analysis. Optionally, also analyze 100 μl of the negative fraction and 20 μL of the original fraction. Add 5 μL of Anti-GLAST (ACSA-1)-APC, mouse antibodies. 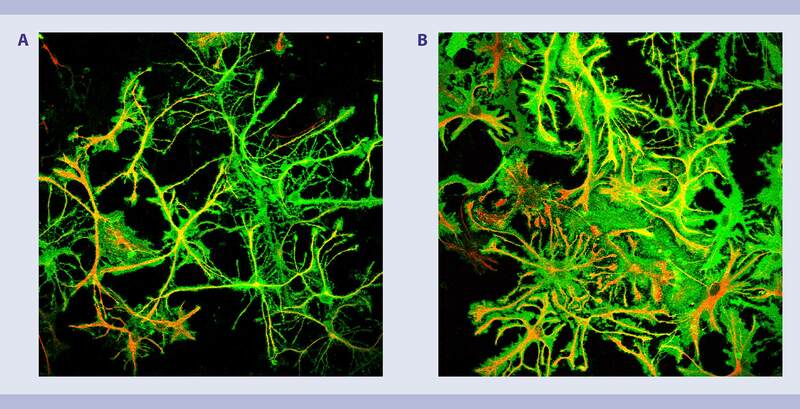 Successful culture of GLAST-positive astrocytes isolated from neonatal mouse brain tissue. P3 whole mouse brains were dissociated using the Neural Tissue Dissociation Kit (T) and astrocytes were isolated from the single-cell suspension using the Anti-GLAST MicroBead Kit. Astrocytes were cultured in MACS® Neuro Medium, MACS NeuroBrew®-21, 1% P/S, and 0.5 mM L-glutamine on PLL-coated glass coverslips (5×104 cells per well). After 3 days (A) and 6 days (B), cells were fixed and stained with astrocyte-specific antibodies Anti-GLAST (green) and Anti-GFAP (red). P3 whole mouse brains were dissociated using the Neural Tissue Dissociation Kit (T) and astrocytes were isolated from the single-cell suspension using the Anti-GLAST MicroBead Kit. Astrocytes were cultured in MACS Neuro Medium, MACS NeuroBrew-21, 1% P/S, and 0.5 mM L-glutamine on PLL-coated glass coverslips. After 3 days (A) and 6 days (B), cells were fixed and stained with astrocyte-specific antibodies Anti-GLAST (green) and Anti-GFAP (red). Storck, T. et al. (1992) Proc. Natl. Acad. Sci. USA 89: 10955–10959. Wahle, S. and Stoffel, W. (1996) J. Cell Biol. 135: 1867–1877. Kimelberg, H.K. (2004) Neurochem. Int. 45: 191–202. Kriegstein, A.R. and Götz, M. (2003) Glia 43: 37–43.